Here is a quick guide to many of the most commonly used tools and resources that NOAA OR&R offers for oil spill responders and planners. General emergency responders may also want to refer to the quick list of tools and resources for chemical spill response. NOAA develops a number of emergency response and planning tools for dealing with oil and chemical spills. Desktop GNOME, a trajectory model that predicts the possible route pollutants might follow on the water's surface. WebGNOME, our online interface of GNOME, in beta state. PyGNOME, a scripting interface for automation and batch processing. GOODS, a tool that helps GNOME users access base maps, ocean currents, and winds. ADIOS®, an oil weathering model. Trajectory Analysis Planner (TAP), oil spill contingency planning software. NUCOS, a unit converter that includes units unique to oil spill response. ERMA®, the online mapping tool for environmental response data, adapted to a variety of regions. CAFE Database, a program to help responders in their assessment of environmental impacts from oil or chemical spills into an aquatic environment. Response System Planning Tools, tools to assess system performance of oil spill response methods, including mechanical recovery of oil, dispersant application, and in situ burning of oil. FOSC's Guide, describes the scientific products and services that NOAA can provide to FOSCs (Federal On-Scene Coordinators). Incident Command System (ICS) forms, available as an electronic database. Job Aids, field guides to assist with various response tasks. Publications, a list of our spill response reports, guides, and publications. Seafood Safety After an Oil Spill, background information and publications describing how to monitor seafood for exposure and contamination after an oil spill. Training, classes and self-study options for spill response professionals. 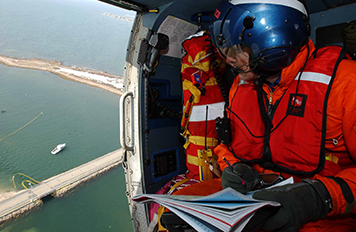 Learn more about OR&R's tools and resources for oil spill response. You can also find contact information for SSCs around the U.S., and a sampling of research publications written by OR&R scientists and other partners.